When it comes to forced induction to add performance and power to your car or truck, the question seems to be "For performance, turbocharger vs supercharger: which one is better?” Unfortunately, that is not so easily answered, as both are different in how they work, in their performance output, and also in what they cost. Motoring trends are showing that by 2020 almost 50% of all new cars and trucks will have either turbochargers or superchargers added to stock engines to improve performance, which is why turbochargers and supercharger kits are surging in popularity. For those who are in performance and dragster competitions, as well as those who want a unique car to cruise in, the turbocharger vs supercharger debate is a big one. There are a lot of supporters on both sides, ensuring this debate will continue as long as we have the internal combustible engine. This article will give you the information you will need to choose which option, turbocharger vs supercharger, will give you the performance you are looking for in your car or truck. When discussing turbocharger vs supercharger it is useful to know what they are and what they each bring to the table performance wise. First, what does “forced induction” even mean? Forced induction is simply the forcing of air into the engine to increase the power the engine will put out. Turbochargers and superchargers both use forced induction. However they do their job in very different ways. Turbochargers are commonly used in cars, trucks, trains, and even aircraft engines. The turbocharger sits off of the exhaust manifold where the turbocharger uses the exhaust gasses to spin the compressor, which then forces the air back into the engine thus increasing the air pressure. Turbochargers are more efficient than superchargers, as the turbocharger is not using the engine to work. The Swiss engineer Alfred Buchi had the first patent in 1905 for turbochargers, although it took nearly 20 years to bring that idea to life. Since then the turbocharger has gone from powering large maritime engines to being added to aviation engines during WWII, with the B-17 Flying Fortress being one of the most famous aircraft that used a turbocharger. The turbocharger found its popularity in car and truck engines when it became clear how they could allow smaller-capacity engines to have improved fuel economy, reduced emissions, higher power, and considerably higher torque. Turbochargers also have the added benefit of not being connected to the engine, so they can spin faster than the engine, thus supplying more air and boosting power. Superchargers were first used on a two-stroke engine in 1878, and the world has not looked back. Gottlieb Daimler received a German patent for a supercharger in 1885, but it was the Mercedes 6/25/40 hp and Mercedes 10/40/65 hp that introduced superchargers in a production vehicle. Superchargers were introduced for both models in 1921 and both boasted the Roots supercharger. Engineers distinguished them as 'Kompressor' models, and these are the origins of the Mercedes-Benz badging. Superchargers are mounted on the engine, where a belt drives the supercharger. As the engine spins, the belt spins the supercharger, which then feeds air back into the engine. The pulley determines how much spin a supercharger will have: the smaller the pulley, the more boost is put out. T,he supercharger is driven by the engine so the more RPMs the engine produces, the more efficient the supercharger becomes. Also, since a supercharger is belt driven, they are more reliable and have none of the dreaded “turbo lag” that is found in turbochargers. Discussions still rage on in engineering circles over the turbocharger vs supercharger issues, and on which one is better for production of power and torque. Both turbochargers vs superchargers have their pros and cons which will ultimately determine which one is the best fit for your car or truck needs. Turbochargers are great for small engines to get more horsepower and torque, turbochargers use what would be otherwise be wasted exhaust, which does improve efficiency. Turbochargers also come in a variety of styles so that the added power can be used when you need it. The downside to turbochargers is that they need optimum RPM for best efficiency, which means drivers experience “turbo lag” that comes from the time it takes for the engine to produce enough exhaust to power the turbocharger and the time it takes for the turbocharger to redirect the air back into the engine. Another big con with a turbocharger is the oil line and lubricant needs of the bearings in the turbocharger. This puts added demand on engine oil and creates increased heat that can break down the lubricants, so there is an additional maintenance upkeep that comes with the turbocharger. Superchargers have a more consistent power delivery, and there is no lag with superchargers, as the power is driven by the engine’s crankshaft. This is probably one of the biggest advantages superchargers has: immediate power when you hit the fuel pedal. Superchargers seem to work best on big V8 engines, given Superchargers have a lower RPM threshold than turbochargers, and superchargers are normally easier on the budget. For those with smog standards, the supercharger is far more smog friendly than the turbocharger when it comes to buying aftermarket kits. The supercharger does have its own downsides. They are less efficient than a turbocharger, as the supercharger requires power from the engine to work. There is also a reliability issue with superchargers compared to turbochargers, and the added expense and space needs for the intercoolers to keep heat from causing damage to the engine. Prices can vary according to make and model of the vehicle and the quality of the turbochargers vs superchargers. You can find turbochargers at the reasonable rate of around $400 for smaller engines up to around $2,000 or more for larger engines for those who want to DIY it. With sealerships or mechanics, the price for smaller engines can start around $1,300 up to over $4000 for larger engines. Some of the higher end turbocharger kits can start at $2,000 and go up to $6,000 or more. Superchargers can range in price from $2,500 up to $8,000, again depending upon the make and model of your vehicle and the quality/output of the supercharger you are looking for. 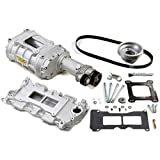 You can find turbochargers and supercharger kits both at physical stores and online but research well to find the right kit for your car or truck. While a Jeep isn’t normally the first vehicle that comes to mind for bolting on a turbo kit, Jeeps are not normally high-powered engines so having more horses to play in the mud or pull a friend out of the mud would be useful. The kits starts around $$ and up, depending upon added accessories. Average installation time should take about a day. 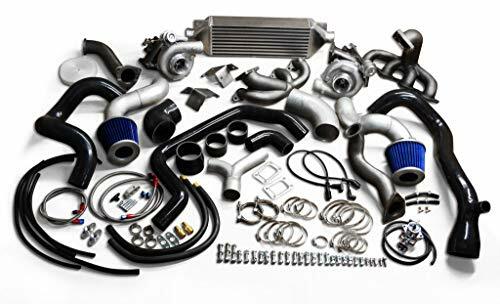 The turbo kit comes complete, and if budget is an issue, the intercooler can be added later. Banks offers a limited lifetime warranty, with the lifespan of the turbocharger being between 100,000 to 150,000 miles. 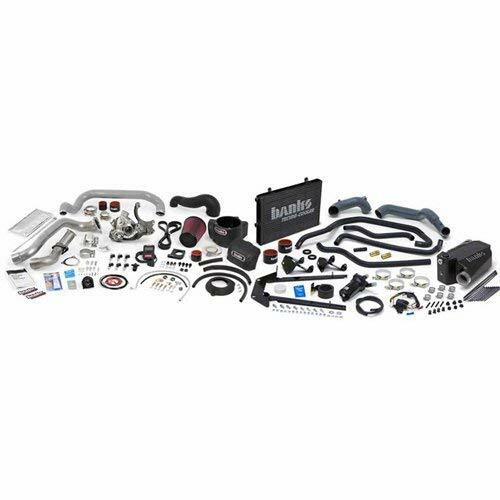 This complete kit comes with intercooler, vacuum lines, clamps, brackets, check valves, hardware, oiling system, and pcv system. 564 horsepower gets sent to the wheels at this pre-set psi. Requires about a weekend's worth of time for knowledgeable DIYers. Complete kit has everything needed to install this, and while it comes with heat wrapping, it is recommended to ceramic coat all the hot parts prior to installation. Limited warranty for the lifetime of the charger. All new parts, including thick-walled cases and roters to eliminate high RPM flex. This supercharger eliminates lag with instant power. 25% to 40% gain in power, and all while maintaining drivability. Depending upon your mechanical skill, with simple tools this installation can take 1 to 2 days. Weiand is a high-quality parts warehouse whose founder Phil Weiand was an innovator in drag racing. What comes out of this company is generally of the best quality. 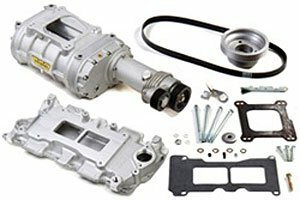 This supercharger features double-pinned rotors, heavy duty front and rear bearing plates, and an intake manifold with a pop-off valve located to the back. Prices start at around $$. Increases performance between 45% and 50%. Installation averages between 1 or 2 days for knowledgeable DIYers. With two lobe rotors for a maximum boost at lower RPMs, this supercharger kit has a new case, end-plates, manifold and snout. Billet belt tensioner components and V-belt pulleys round out the package to give you everything necessary for installation. This should produce an extra 10-12 lbs of boost on small blocks and 5-7 lbs of boost on big blocks. More modifications can make this a friendly addition for the dragster. than a supercharger may be what you are looking for. If you want to nurse as many horses out of your engine as possible, then a turbocharger may work best. When it comes to fuel economy in the turbocharger vs supercharger debate, the turbocharger wins out. When considering the turbocharger vs supercharger, many recognize that it is the turbocharger that is superior in reducing smog emissions, making them a greener addition. Engineers are also working on reducing and even eliminating the lag time that plagues turbochargers. But if you're on the supercharger side of the turbocharger vs supercharger debate, do not worry that superchargers will go away any time soon. 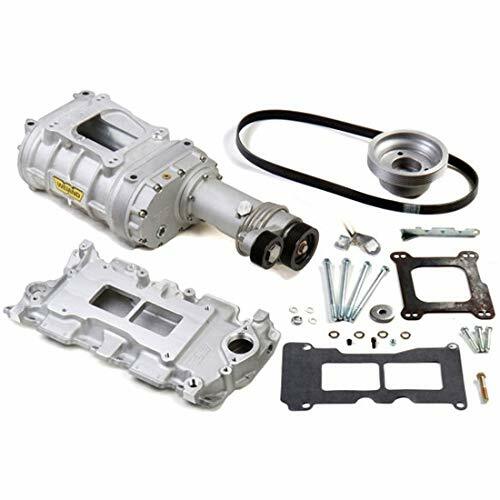 Drag racers and other high-performance vehicles require that instant power and torque that superchargers bring.